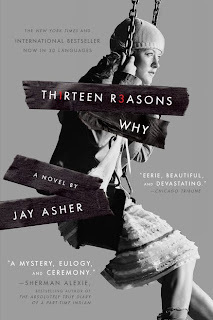 The Compulsive Reader: Contest: Win a Copy of 13 Reasons Why! Penguin has also the 13RW Project at www.13RWProject.com as a place for fans of Thirteen Reasons Why to record their thoughts, stories, videos and photos relating to the book, and to view what other readers from all across the country have shared. Each review is logged on a map to show the many locations that viewers are posting from, and all content is shareable through Facebook and Twitter. To enter, go visit the website and look around, then come back and comment here about what you thought was interesting or about what you shared. This contest is open to US residents, and will end on July 7th! I read 13 Reasons Why in a young adult literature class in college. Now as a teacher, I am constantly thinking about that book. I need to consider how students think and how seemingly small jabs and pokes can affect a student's life. It is definitely an incredibly important book, and I think everyone should read it. I'm really proud to see how this book has touched so many people. I'd like to incorporate this project in my classroom sometime. I haven't gotten the chance to get the book but I definitely am going to keep my eye out for it! I read the reviews on the website and the book looks like it has moved so many people's lives and I am really excited to look for the book! I love inspirational books!!! This book has been on my To Read list for a while, but I haven't gotten around to it yet. The biggest thing I noticed from the 13RWProject site was that the book changed so many people's lives. I would love to know what about this book makes it so important, and I hope to know soon. The reviews are very striking. It makes me more interested in this book and I also think this subject needs to be approached. I have been meaning to read this book for quite some time. I loved reading through what people had shared on the 13RWProject website. This book seems to have touched and impacted a lot of people. I'm very interested in a book that has that powerful of an affect, especially if it's a YA novel. I absolutely adored this book. I listened to the audiobook last year and was hooked from the very beginning. The reader was excellent. What I like most about the website is that you can choose your specific state and view reviews. It is such a powerful book, and I'm so glad there is a website and movie for it! Plus, I heart Selena Gomez! That website is fantastic and makes me want to read the book again. I was really touched as well with Thirteen Reasons Why and after finishing it was seriously considering how I act toward old friends in the hallways. So many great messages inside this book! I thank Jay so much and thank you for the chance to win the paperback! I have read this book and also posted a review about this in my blog. I have had mixed feelings. While I sympathize and empathize with the things that Hannah Baker went through, I felt that she never let anyone help her - all the blame was put on others. Finally letting the innocents take the blame, along with the guilty. It just didn't sit well with me. May be the people who take such extreme step HAVE such outlook in life?